24 snack ideas to satisfy your cravings. Snacking has gotten a bad rap, thanks to our tendency to choose empty-calorie snack foods like candy or chips to ease between-meal cravings. But when your stomach starts growling hours before your next meal, a healthy snack is actually a good idea, to hold off hunger and keep energy levels high. In this list, you'll also find heart-healthy mixed nuts and two types of microwave popcorn that offer a more healthful option for all those popcorn addicts out there. And, in case you like some protein along with your crunch, Bumble Bee Tuna now offers a fat- free tuna salad kit complete with low-fat wheat crackers. There's not much in the way of fiber, but the 9 grams of protein could be just what you need in a filling afternoon snack. The first type of product listed under the "something hot" category consists of microwavable entrees. These products come in handy stored in your desk at the office or in your pantry (the kids can fix them themselves in a pinch). Just remember to recycle the packaging. Many parts are recyclable. Sometimes, there's nothing more soothing than a serving of hot cereal. 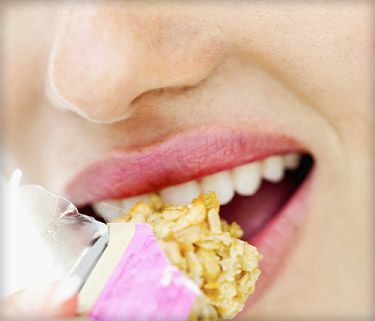 The Quaker Weight Control line of instant oatmeal is packed with fiber, each packet contributing a whopping 6 grams! It's also much lower in sugar than your average instant oatmeal, with only 1 gram per serving. It does contain the alternative sweetener sucralose (Splenda).